Do you have $50 burning a hole in your pocket? EB Games is happy to relieve you of your financial burden in return for a pre-order receipt for a Sony PS4. 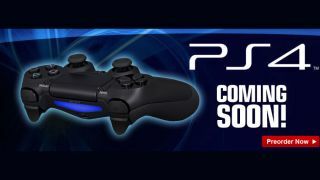 Only hours after Sony officially unveiled the idea of a PS4, EB Games has the new console loaded into its systems, and a pre-order page published to its website. The store is quoting a AU$899 price tag for the console and AU$118 for the just announced PS4 launch titles; though these are are likely placeholder prices only and likely to change before the console's actual release. Those pre-ordering the PS4 are doing so sight unseen, as Sony withheld a look at the console during its announcement event this morning. At the time of writing, EB was the only store setup for pre-orders, with a JB Hi-Fi staff member telling us they should have the new console in their system tomorrow, and a Gamestrader staffer saying it would only be added after it was "officially announced".